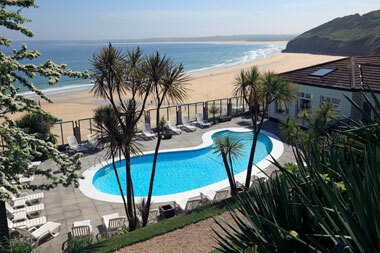 South west England is a popular choice of destination for holidays. There is such a wide choice of self-catering accommodation, in pleasantly green rural areas and on the coast. Find every possible variety of holiday accommodation with a swimming pool, there are pine lodges, country cottages including a fair number of thatched picturesque cottages, luxury apartments on golf courses, big properties such as mansions and manor houses. Holiday parks are also present in abundance, places where holiday properties are set around central facilities that often include a swimming pool or a full scale leisure centre. The West Country juts out into the Atlantic ocean, bordered on either side by the English Channel and the Irish Sea. The north coasts of Cornwall and Devon have a reputation for big waves, ideal for surfing and surfers descend on the area in their thousands every summer. The beaches from St. Ives to Newquay are especially good for surfing breaks and visitors would find a collection of surf schools and equipment hire at every seaside resort. The broad deep sands of Newquay are one of the very best locations for surfing. Padstow and Rock on the opposite side of the River Camel are popular with sailing enthusiasts. 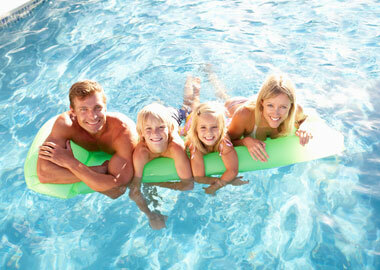 There are a large number of luxurious holiday homes to rent; some with swimming pool. Padstow also features a few Rick Stein restaurants and a picturesque harbour. Falmouth is another Cornish town with a sailing reputation and has numerous up-market holiday homes with their own pools to rent for summer holidays. The southern coast in the English Channel is sheltered and calmer. Here there are peaceful seaside resorts, many with superb sandy beaches. Some of the nicest family friendly beaches stretch eastwards from Hope Cove on the South Devon Heritage Coast up to Sidmouth in Devon and through to Lyme Regis in Dorset. Again, there are thousands of cottages with pools to rent on the south coast, both in holiday parks and independent cottages. The national parks in the West Country deserve a mention. Walkers are naturally attracted to these great natural expanses of wilderness in Dartmoor and Exmoor and large houses offer self-catering breaks. The large holiday concerns are more able to justify and afford the cost of a swimming pool and often have excellent facilities for larger groups. Somerset is not as far to travel for most holidaymakers as Cornwall or Devon and offers a similar holiday experience in that there are seaside towns such as Burnham-on-Sea and Weston-Super-Mare that have acres of sandy beach and a good coastline. It also has fascinating towns like Glastonbury, an Area of Outstanding Natural Beauty in the Mendips and visitor caves at Cheddar and Wookey Hole. Rent a holiday home in Somerset that has its own swimming pool and a holiday is complete; enjoy lots of places to visit and a nice place to return to for a swim, dinner and bed. A holiday in England’s south west is highly recommended for its scenery, character, huge number of open gardens and visitor attractions. Find that place to stay with a swimming pool that fits your pocket and needs and anticipate the prospect of a happy holiday.